Cape Gate (Pty) is South Africa's largest producer of wire products, manufacturing a wide range of wire products for one of the world's most demanding industrial markets. 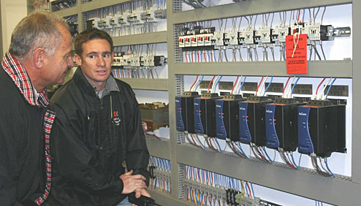 Every machine in Cape Gate's Vanderbijlpark manufacturing plant must run at maximum efficiency and reliability to produce the high quality products the company is famous for, and this is why Cape Gate chose to install AuCom CSXi soft starters on its production lines. "They are amazingly reliable and have reduced our downtime and maintenance workload. The fans and motors run so smoothly, AuCom is the perfect solution for us" said Jean Guccio, Cape Gate's Electrical Maintenance Manager. Jean worked closely with Pieter Erasmus from CHI Control to replace outdated star-delta starters with modern CSXi soft starters. CSXi soft starters are now used on wire draw machines in Cape Gate's barbed wire line, and on cooling fans on the wire galvanising line. The smooth, controlled start ensures consistent quality of manufactured product. Sudden extreme movement can stretch or snap the wire while it is being drawn. Current limit soft starting keeps start current at an acceptable level, while avoiding the transients which occurred with the old star-delta starters. The simple configuration and clear feedback display simplify installation. Communication interfaces allow full integration into existing control and automation networks. Cape Gate is now integrating the cooling fans into its factory-wide DeviceNet SCADA system. Conformal coating of the printed circuit boards ensures the CSXi is reliable in even the most demanding environments. The built-in thermistor relay substantially improves the protection against motor overload. "Installing AuCom starters has solved most of our mechanical problems, and they are so simple and easy to use" said Jean. "Even better, they can give us more process information than was available before. I hope that one day soon, all our plant will run this smoothly!"